Fifty-year Freemason Billy Wright joins Callahan Lodge Worshipful Master Herb Ray and 50-year member John Page. Wright and Page received their 50-Year Grand Lodge certificates, pins and gold membership cards. The Callahan Masonic Lodge held its annual Past Masters and Widows Night Banquet Nov. 3, honoring two 50-year members. The evening included music provided by the Freedom Express Band along with a steak and salmon meal served by Lodge Senior Warden Brian Jahay and the kitchen crew. Worshipful Master Herbert Ray recognized all past masters and spouses, widows of Freemasons and members of the Order of Eastern Star in attendance. 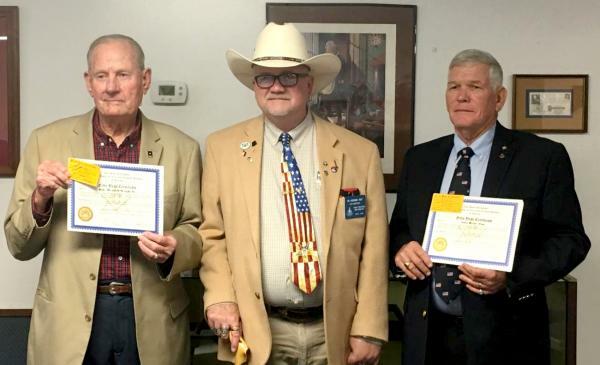 He gave special attention to Lodge Brothers John Page and Billy Wright and presented each with a 50-Year Grand Lodge certificate, pin and gold 50-year membership cards.